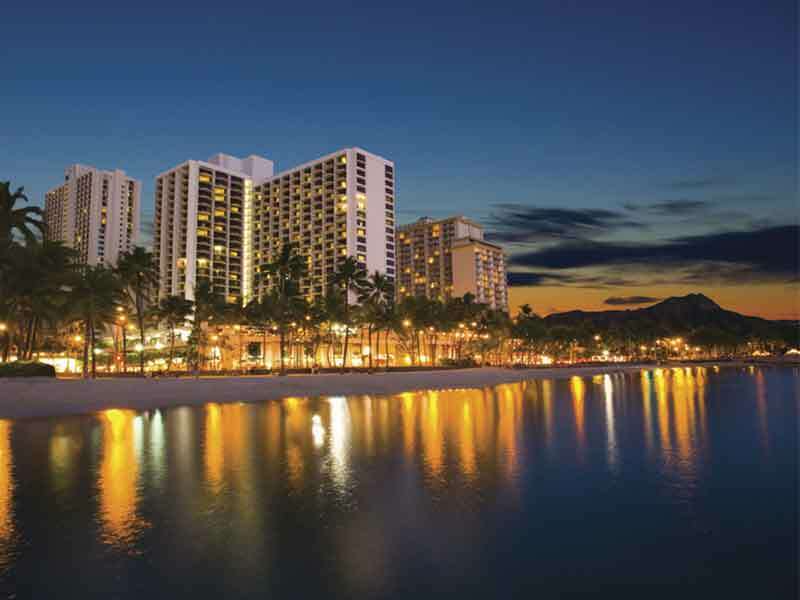 Find yourself on the edge of beautiful Waikiki Beach, when you stay the luxurious Waikiki Beach Marriott Resort & Spa! Standing tall in the heart of Waikiki Beach, this newly renovated resort is surrounded by swaying tropical palm trees and is close to everything! Set just steps away from the ocean and surrounded by boutique shops and iconic landmarks, this is the perfect place to observe and enjoy Waikiki! The Waikiki Beach Marriott Resort & Spa has recently undergone a multi-million dollar renovation and now offers a range of award-winning facilities! Spanning 5.2 acres, this grand resort welcomes guests in through a beautifully modernised lobby that looks out toward swaying palm trees! Spend your days by one of 2 outdoor saltwater pools, float in the whirlpool, or work up an appetite at the Fitness Centre. There’s a range of equipment available in the centre, including cardio machines, free weights, and a stretching area with yoga mats, plus guests have exclusive 24-hour access! 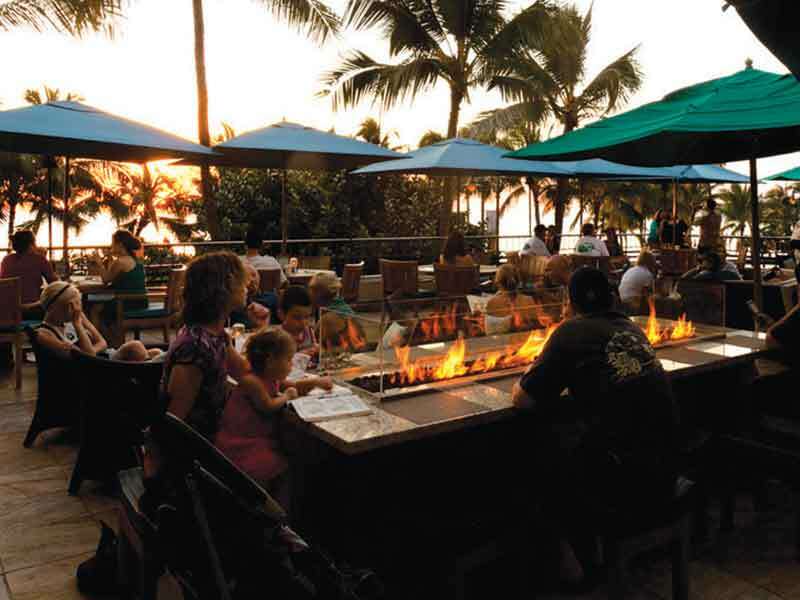 There are 5 restaurants to choose from at the Waikiki Beach Marriott Resort & Spa. Choose between American, Asian-Pacific, and Italian cuisines, plus enjoy free nightly entertainment at the Moana Terrace by the pool! After a night full of dancing, recover with a rejuvenating spa treatment at the Royal Kalia Spa. 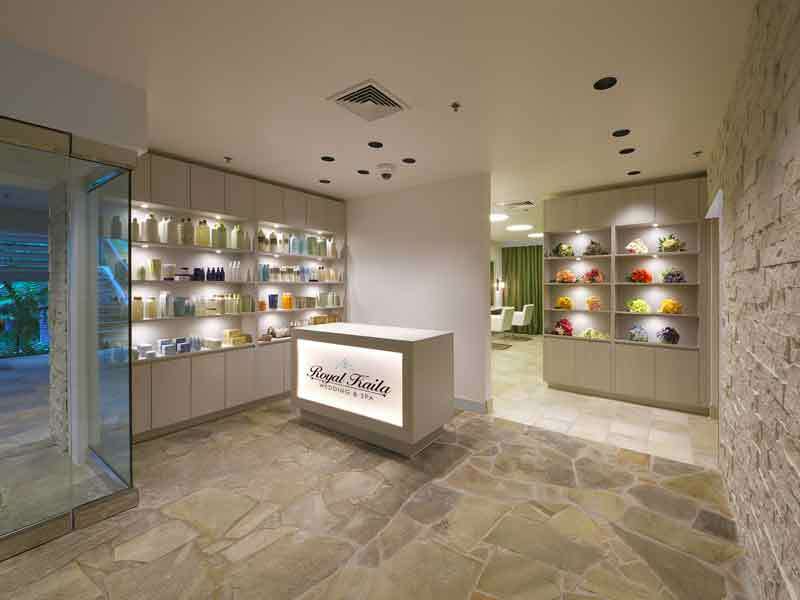 This full-service day spa is an Aveda concept facility and has a team of experienced beauty professionals and therapists waiting to welcome you into their relaxing environment! 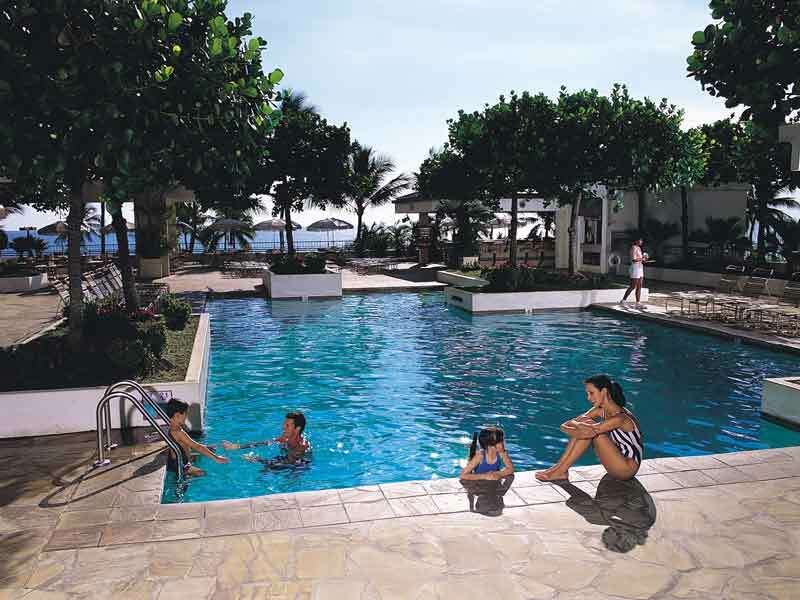 The Waikiki Beach Marriott Resort & Spa has baby sitting and childcare facilities, a business centre, and 19 wedding and event spaces. These venues vary in size and the largest is capable of holding up to 1000 guests! 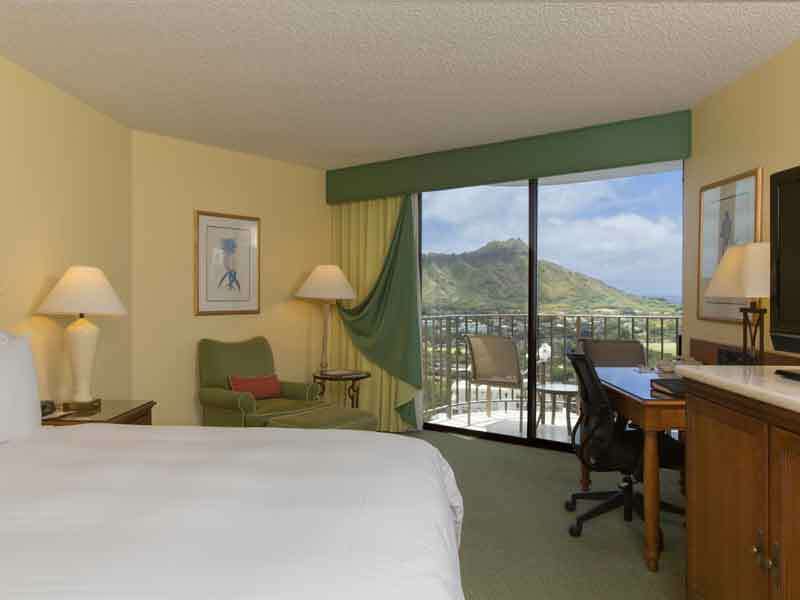 Stay at Waikiki Beach Marriott Resort & Spa and wake up to breathtaking views of the ocean, mountains or Diamond Head. The ideal waterfront location means that Waikiki Beach is just a short stroll and there are boutique shops, cafes and restaurant just across the road too. 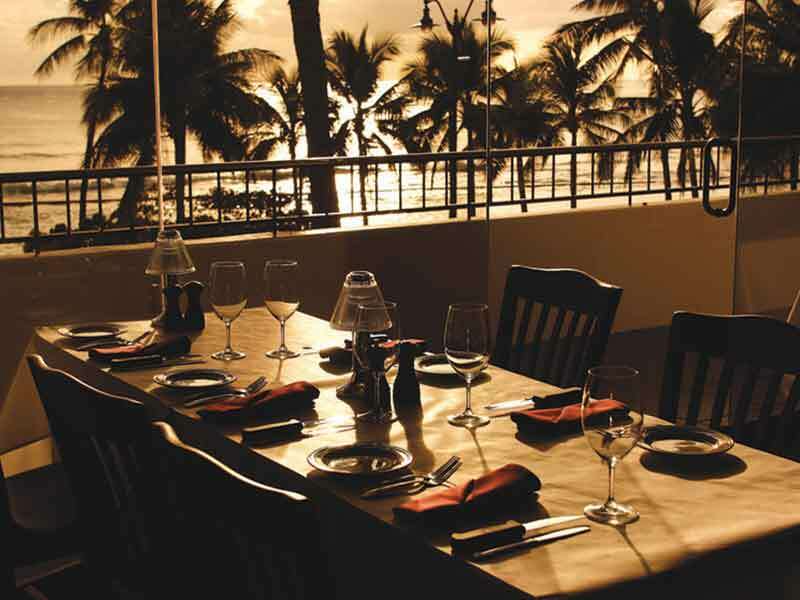 Waikiki Beach Marriott Resort & Spa meet expectations then exceed them with the range of resort services and the accommodating island hospitality to ensure your stay is as comfortable as it can be. 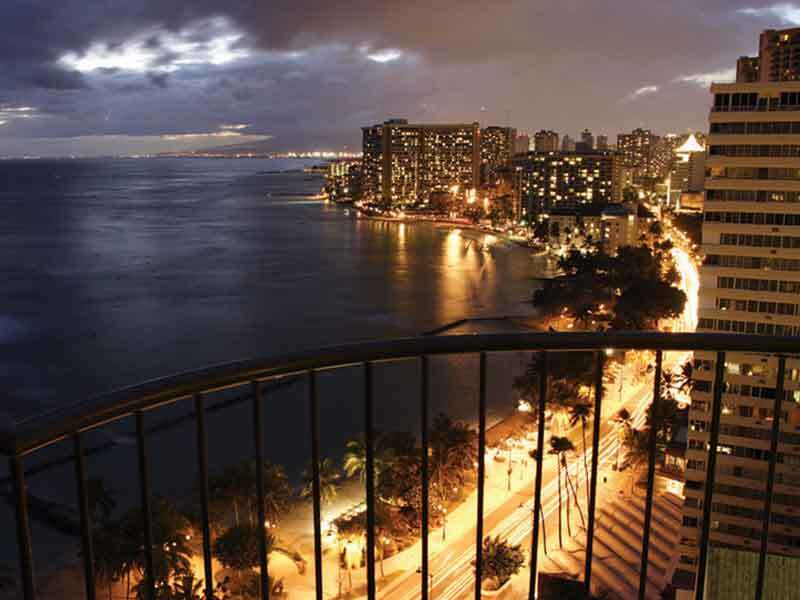 Enjoy luxurious amenities and views of Waikiki and the Pacific Ocean when you stay in an Ocean View Room. Wake up in the morning and sip on a tea or coffee from your own private balcony, let the air light circulate through the rooms floor-to-ceiling windows and relax and unwind with a bath. At the end of each day in tropical paradise rest on your king or double bed configuration with a plush pillowtop mattress and duvet. These rooms offer approximately 38sq. metres of space and can sleep up to 4 guests. Upgrade your stay to an Ocean View Premier Room and really soak up all that this central Waikiki resort has to offer. 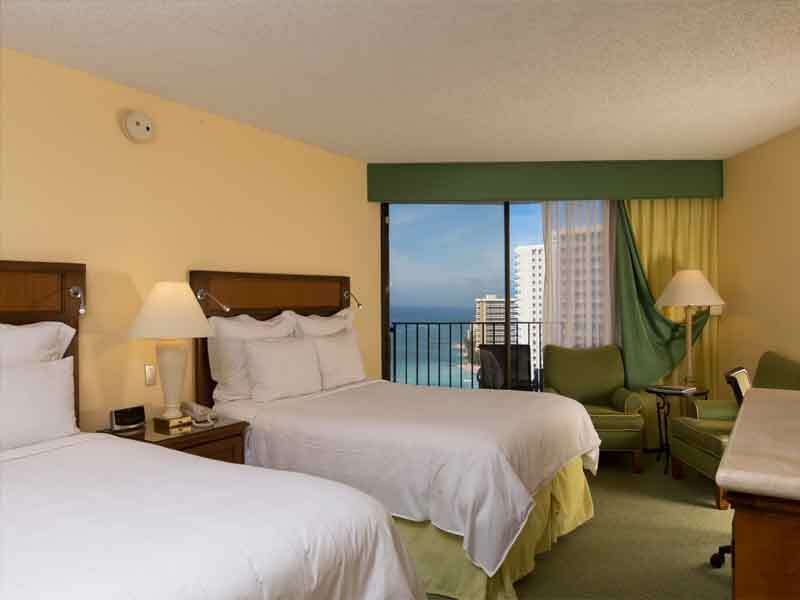 Wake up on luxurious pillow top beds to take in stunning ocean views over Waikiki Beach. Let tropical breezes float in through your balcony doors, enhancing the experience provided by the island-inspired décor of the room! These rooms come in either King or Double configurations and can accommodate up to 4 guests. Spread out and enjoy free Wi-Fi, a 37-inch TV, satellite/cable channels, CNN, ESPN, pay-per-view movies, and a desk, couch and chair on which to make use of it all! This room is 32sq. metres & sleeps up to 4 guests. 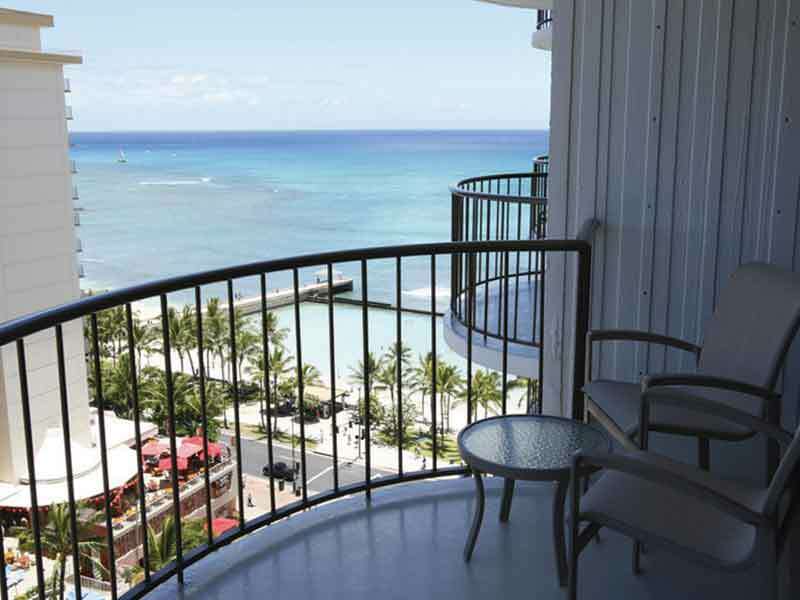 Marvel at the stunning views of Waikiki Beach from the private balcony of your Ocean View Junior Suite Room. Wake up in a light-filled space each morning with floor-to-ceiling windows that can be opened so you can enjoy the ocean breeze! Sit back and relax after a day packed full of activities on 1 King or 2 Queen beds. The suite is air-conditioned and designed with island-inspired décor. It features free Wi-Fi, a 37-inch flat screen TV with cable/satellite, CNN and ESPN channels and pay-per-view movies, making it the perfect base for your Hawaiian getaway! Sip on tea and coffee throughout the day and snack on treats from your own mini-bar! This room is 49sq. metres and sleeps up to 4 guests. Located just over 12km from the Honolulu International Airport, this stunning resort commands its position in the heart of Waikiki Beach. The ocean is just steps away from the lobby and Diamond Head is only 800 metres away! In addition to its ideal waterfront location and proximity to so many attractions, the Waikiki Beach Marriott Resort & Spa, has plenty to keep you occupied within its own 5.2 acres! 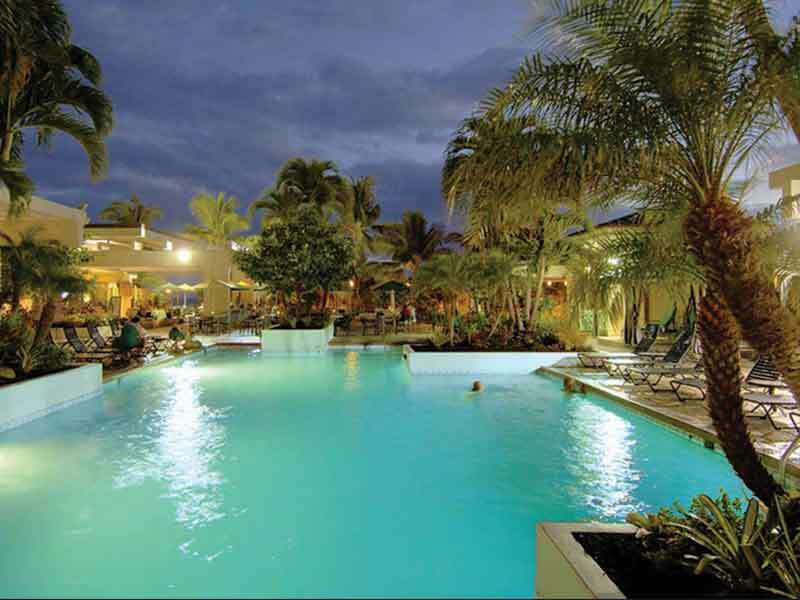 Spend your days by one of 2 outdoor saltwater pools, float in a whirlpool, or workout at the 24-hour Fitness Centre. Unwind completely in the Royal Kaila Spa with a full range of services and luxurious Aveda products and when hunger strikes, choose from any of the resort’s 5 restaurants. Enjoy buffet breakfast and sample American, Asian-Pacific, and Italian cuisines for lunch and dinner. In the evening, you can dance your night away with free nightly entertainment, drinks, and food at the poolside Moana Terrace! The Waikiki Beach Marriott Resort & Spa is the perfect, picturesque venue to host a wedding or event—there are 19 different event rooms to choose from and outstanding catering available on site! Business travellers are also accommodated with 16 breakout rooms and connectivity, plus the resort is conveniently located less than 3 kilometres away from the Hawaii Convention Centre. If paradise is on your bucket list then Waikiki Marriott Resort & Spa is your destination. It’s only a short walk away from the turquoise beach and the city centre hub. Friendly hospitable staff that treat you special. 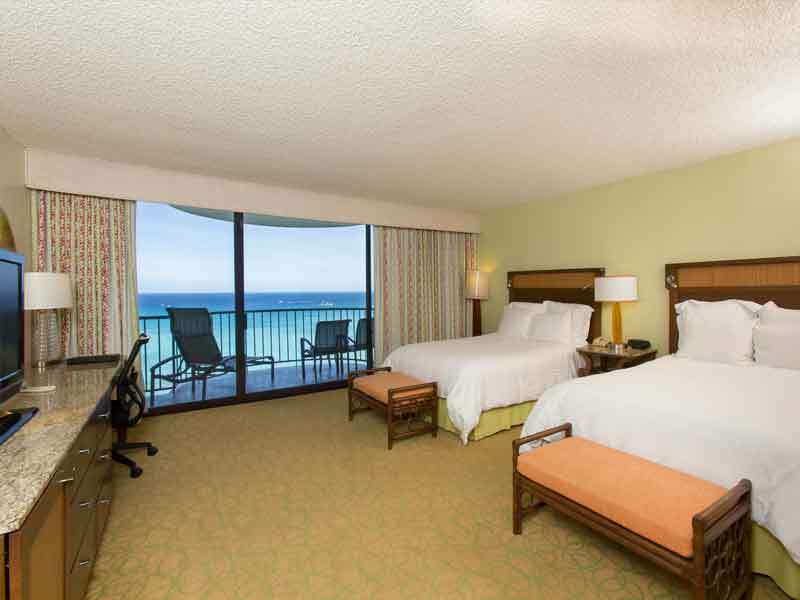 Rooms are spacious and clean – and yes the views are phenomenal. Your stay becomes one unforgettable experience of a lifetime.